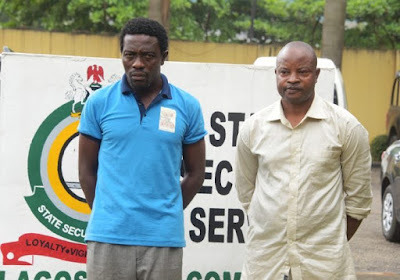 Parading the prime suspect and his accomplice at the DSS Lagos Command, Director of the Command, Mrs. Betty Adoki, said Jackson, 46, who had arrived Lagos on Sunday, November 11 and was received at the airport by Adedoyin was held hostage on November 21, where she was allegedly r*ped several times by the suspect. According to her, the American Embassy in Lagos had reported to the Command about Jackson’s abduction and that they immediately commenced investigation which culminated in the raid of the criminal hideout by a team of security operatives and Military personnel of the 9 Brigade, Nigeria Army, Lagos. She said Adedoyin, in furtherance to his deceit, was discovered to have reserved Protea Hotel, Ikeja, as accommodation for the victim while in Nigeria, but deliberately moved her to another hotel, in order to prevent the monitoring of Jackson by the Embassy, while he eventually seized the International Passport, credit card and United States Identity card of the victim in order to prevent her possible escape. “Consequently, on November 26, 2018 about 0200hours, Jackson, was rescued from the captivity of these criminal elements who are suspected to be internet fraudsters and kidnappers. Jackson was held hostage at No. 7, Akanbi Street, Abule Egba, Ifako-Ijaiye LGA, Lagos by one Mathew Adedoyin and his accomplice, Idowu Ayeni,” Mrs. Adoki said. Speaking to journalists while being paraded, Adedoyin, who claimed to be real estate agent, denied abducting the victim or r*ping her, saying that she asked him for s*x, adding that her flying down to Nigeria was on her own volition with the intention of getting married to him.